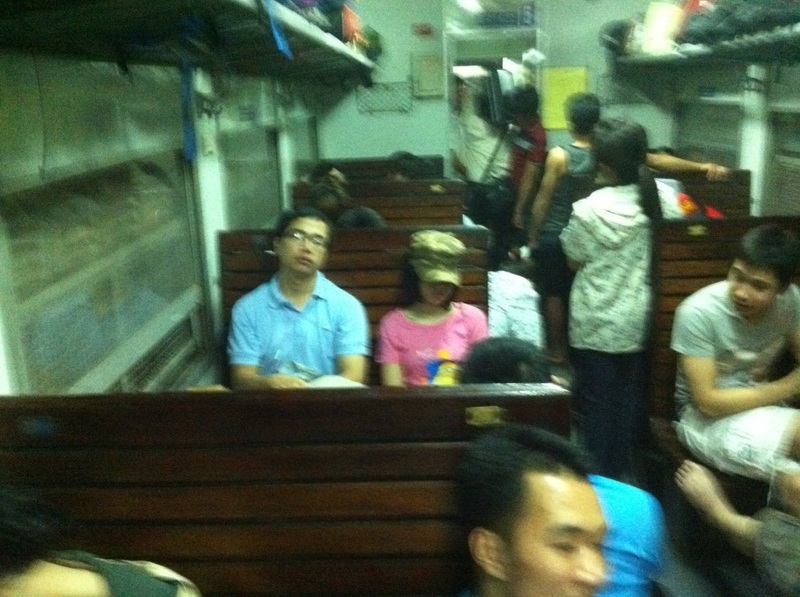 This article is about my experience after a night in a Vietnamese lowest-class train. On a holiday from April 30thto May 5th 2014, a group 6 people of us decided to climb up to Fanxipan the highest mountain in Indochina for memorable memory together. To save money, we use the cheapest ticket. LC1 train, from long years ago was used as a most convenient transporter for traders. Because authorities did not tighten the privacy, traders brought with them everything on the train, from poultries to garment. As the open up privacy in 1986, people’s living standard was enhanced, the Vietnam Railway Company built up the service package for higher income passengers with other luxury train. LC1 is concerned as a train for poor people. But as a man who was born in a middle class family, I strongly suggest you to try this train at least one a life. It gave me pictures that I had not ever seen before. What a different experience. The departure hour was 21:00, we met each other at Hanoi Train Station. With tickets in hand and luggages on back, we stepped on the train. Because most of passengers are low-income people, the facilities on the train are just for the most basically needs: two seat wooden benches, lights, fans, and of course, no air conditioner. It’s quite interesting that the Railway Company sell ticket for the late-come passenger when all the benches are filled, these passengers must seat on plastic stool placed at the aisle. But it’s too inconvenient, there’re not much people use it, and the solution is to ask others who are already on the bench to allow them to sit together “for a while”, you at first think that it’s just simple “for a while”, but actually it means you’ll share your seat for a whole trip. This is Vietnamese: nice and easy going. The one who travels by this low-price-ticket train for the first time usually cannot sleep. That night opened my eyes. 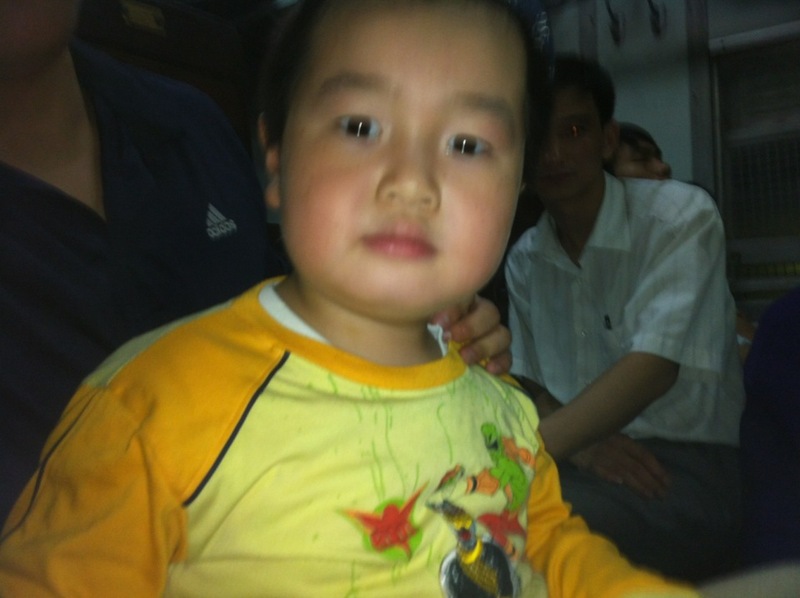 10h30 pm, at YênViên Station, a chubby 5 year old boy stepped in the train with his family. They were finding their seats. I called him in and share him the bench. I was such a cute, clever little guy. I talked the man who I thought was his father. It turned out that his real father was in the hospital due to an accident and the boy was on his trip to visit his father. God bless them! Do you have any idea how deeply they slept? That was my first night in LC1 train. 5h00 am, we centralized at Lao Cai station’s square. Fanxipan is waiting!